Autumn Harvest was a perfect name for this fragrance, and I wish I had a scent description to post with this review but I couldn’t find one. So, I’ll do my best to describe it for you but first, let me tell you a little bit about the brand before I delve into the fragrance itself. – – This series of candles seems to be exclusively manufactured by Illume for Target stores, because Target is the only place I’ve ever found them at. I always see these candles on their own display and can’t help gravitating towards them every time I’m there. I love Illume and this line is so different from what this company normally carries on their own website. I love that since the majority so far seem to be bakery oriented. Autumn Harvest was not bakery but it sure smelled amazing regardless. Okay, time to dig into the fragrance. This candle smelled amazing! Like crisp air, windblown leaves and smoked cedar. It smelled like 100% “fall” and I couldn’t wait to start burning it. I decided to test this candle in a medium size room where it performed perfectly. Once the wicks were lit, it took a good hour or more to reach a full melt pool and from then on out… the most delicious smoked cedar aroma filled my guest bedroom. It kind of reminded me of a campfire scent – like smoldering wood. It was heavy and very masculine. I loved it!! Strength – on a scale of 1 to 10, I would rate this candle a 7 in a medium size room. 10 in a small room. Very nice scent throw overall. This candle pretty good. It did start out slow and it looked like the candle would tunnel in the beginning, but it eventually righted itself for a clean and even burn. I really enjoyed Autumn Harvest and will absolutely purchase it again. In fact, I’ll probably purchase a few to keep on hand. It smelled that good. Definitely check out this scent if you love smoky cedar type scents. It really was amazing. This line of candles from Illume at Target seems to be seasonal with changing scents every few months so if you see a candle and want to experience it, I wouldn’t wait. It may be gone the next time you go back for it. Christina, you’re killing me! Every single time I get one of your reviews in my inbox, I want to go buy more candles! This one, I actually did go buy, and I’m so glad I did. I got the little 4 oz. candle, and it is perfect in my guest bathroom. It’s a pleasing but not overpowering scent, and it’s nice that it’s a candle that men can appreciate just as much as we women do. My candle also threatened to tunnel, and is currently leaving maybe 1/8 inch of wax all around the perimeter of the jar after burning for 3 hours. I think that will be easily pushed back down when I snuff it out. LOL!! So glad you’re enjoying all my recommendations and you liked Autumn Harvest. It is addicting for sure and I’m in the same boat as you… I want everything I see. 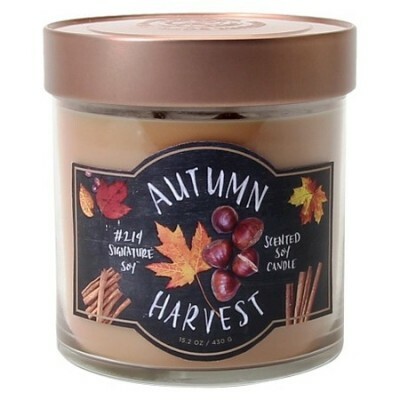 Autumn Harvest was a great scent. Maybe try the bigger one that has 2 wicks next time. That’s the one I purchased and it didn’t tunnel. It burned perfect.